Despite the abnormally hot weather here, I have been craving soup. Soup season is around the corner, and I know that I’m craving the simplicity of soup. 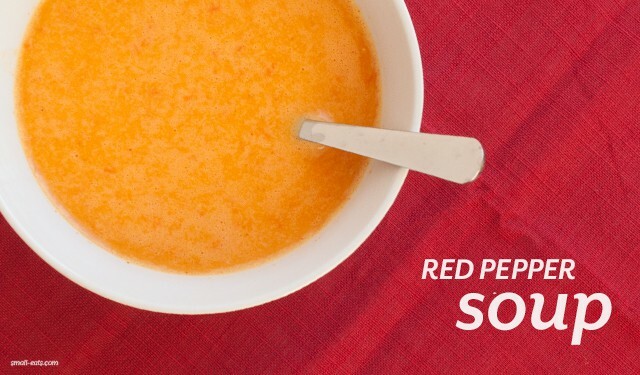 Soup, especially Red Pepper Soup, is pretty uncomplicated. You cut up some peppers, onions, and garlic, and you saute them. And then, when the time is right, they simmer with some broth until they’re ready to be blended and mixed with some coconut milk. Not a lot of ingredients or time is needed to make this recipe, giving you some time back to enjoy a quiet moment with some soup. Next week a new Nutrition DL starts. Is there a seasonal ingredient or pantry staple you’d like to learn more about? Let me know in the comments below or on Twitter. Bring a stock pot to medium high heat with 1 tbsp of olive oil. Add onion, bell pepper, and garlic to pot and saute until softened, about 5-10 minutes. Pour in vegetable stock and spices and bring to boil. Once at a boil, turn heat to low and let the soup simmer for 15-20 minutes. Remove soup from heat. Add in coconut milk and blend using an immersion blender or in batches in a regular blender. Adjust any seasonings, and add the juice of half a lemon, if needed. Is the coconut milk necessary or can I use something else? Thanks for asking! Coconut milk is not necessary. If you want an added creaminess, you can swap out the coconut milk for greek yogurt, cashew cream, or heavy cream.